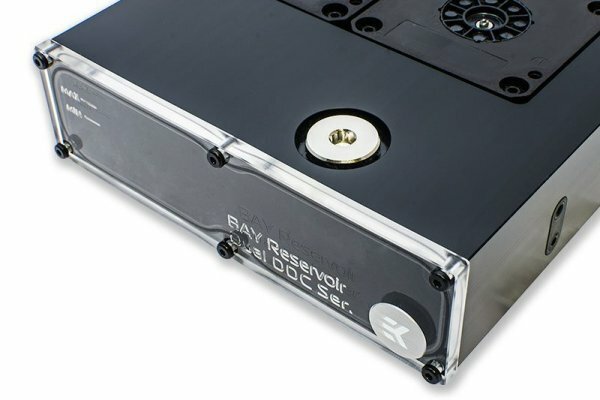 EK-SBAY Dual DDC 3.2 PWM Serial (incl. 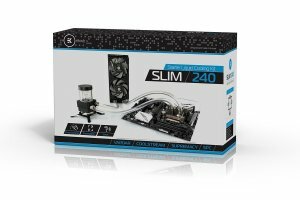 2x pump) is a high-performance 5.25″ single-slot form factor DUAL Pump Unit with integrated reservoir. The unit comes pre-installed with two (2) EK-DDC 3.2 PWM water pumps operating in series. Using two water pumps in series provides twice the head pressure of a single water pump and also guarantees top safety measure – in case of one pump fails the remaining one will provide sufficient liquid flow to prevent any hardware damage due to overheating. Additionaly there is no downtime until next scheduled maintainance. This product features two G1/4 threaded ports which allow for installation of virtually any G1/4 thread fitting / barb. EK recommends EK-CSQ series Compression Fittings/Adapters. This unit also features one G3/8 threaded port on the top of the reservoir which serves as a fill port for the system. 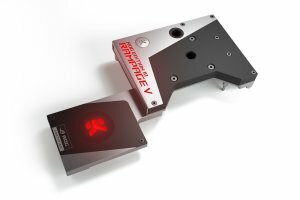 This product also features anti-vibration rubber mounting system which effectively silents this dual pump setup by de-coupling it from the rest of the computer chassis. 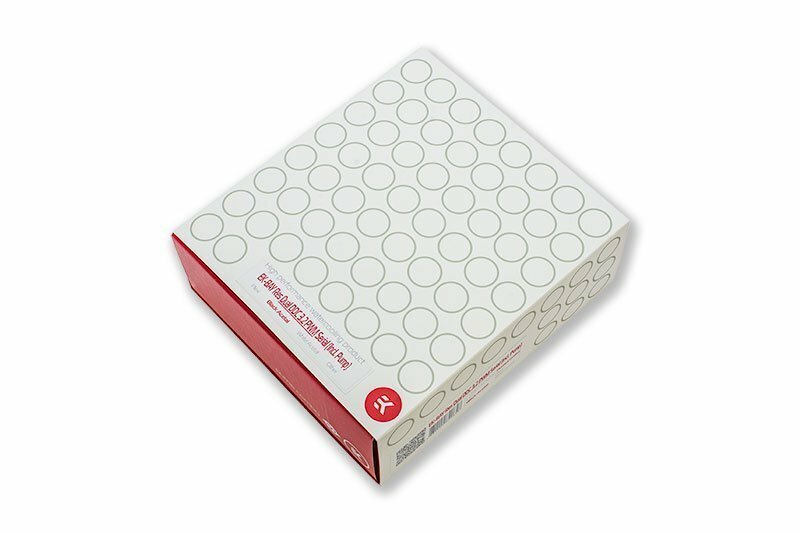 Product is made of high quality POM Acetal. Front cover s made of quality acrylic glass. Mounting mechanism and easy to follow installation guide are enclosed. 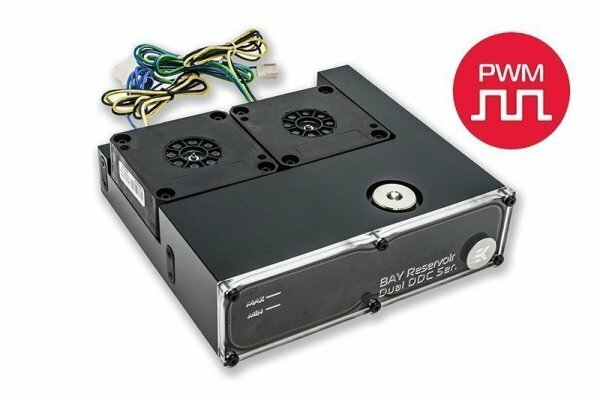 This unit can be upgraded with EK-DDC Heatsink Housing, available in both Black as well as Nickel plated version. 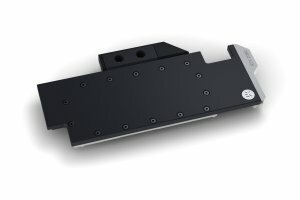 With the installed EK-DDC Heatsink Housing the unit occupies two 5.25″ slots as it portrudes over the single 5.25″ form factor height limitation. Enclosed: – EK-DBAY Dual DDC unit with two pre-installed water pumps (DDC 3.2 PWM) – mounting mechanism – installation manual Made in Slovenia – EU!